Flight-Seeing over Glacier Bay, or HOLY $%^& THAT WAS AWESOME! With my limited vocabulary, I am having a very difficult time writing about my adventures in Alaska. Words like awesome and spectacular and majestic seem trite and inadequate when trying to describe this incredible state. 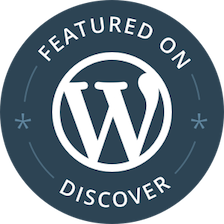 Adding an f-bomb or other expletives in front of those words helps give them emphasis, but this is a family friendly blog. I recently went flight-seeing over Glacier Bay National Park, and my mind was blown yet again. In trying to create a post to sum up the experience, I am left speechless. How do you explain something that is all at once mind-blowing, spiritual, awe-inspiring and, at times, terrifying? I have experienced some unbelievable things in Alaska, from the northern lights to autumn in Denali to close encounters with wildlife, but this ranks right up there with the most amazing. Since I can’t adequately sum in up in words, I’ll take you along on a photo tour. Of course, photos don’t do it justice either. A great philosopher once said, “Trying to experience Alaska through photos is like going to a party through a keyhole.” Let’s look through the keyhole together. After taking off from the Gustavus airport, we flew about 10 miles until we reached the Beardslee Islands, which are rich in wildlife and popular with kayakers. Looking straight down, the water was turquoise and translucent. Kelp forests were visible from the sky and the web of islands almost looked like something out of the tropics, and not Alaska. 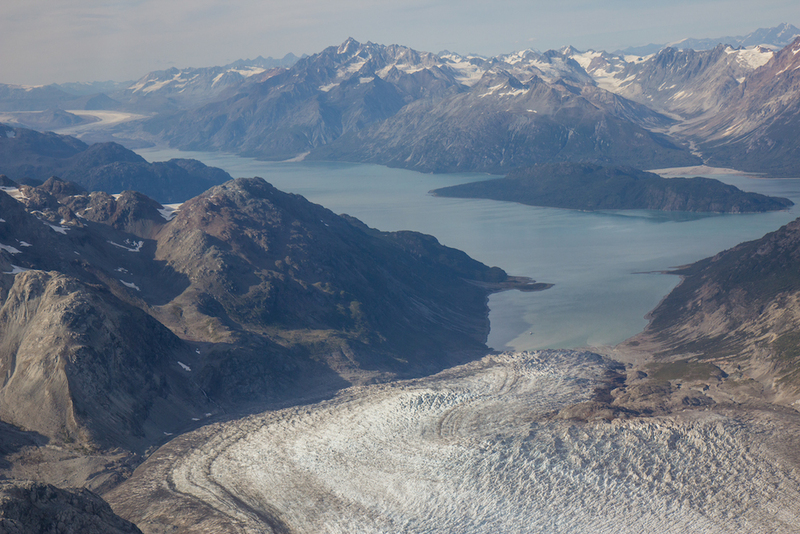 From there, we flew across the lower half of Glacier Bay towards the massive Brady Icefield and the Fairweather Range. The Fairweather Mountains are the highest coastal mountains on Earth and the reason for the glaciers. Warm, humid air from the Pacific hits the mountains, rises, cools and dumps snow, creating the Icefield that spawns numerous glaciers which creep down the mountain valleys. Peaks and glaciers at the edge of the Brady Icefield. Reid Glacier spills down from the Brady Icefield. Can you spot the cruise ship? 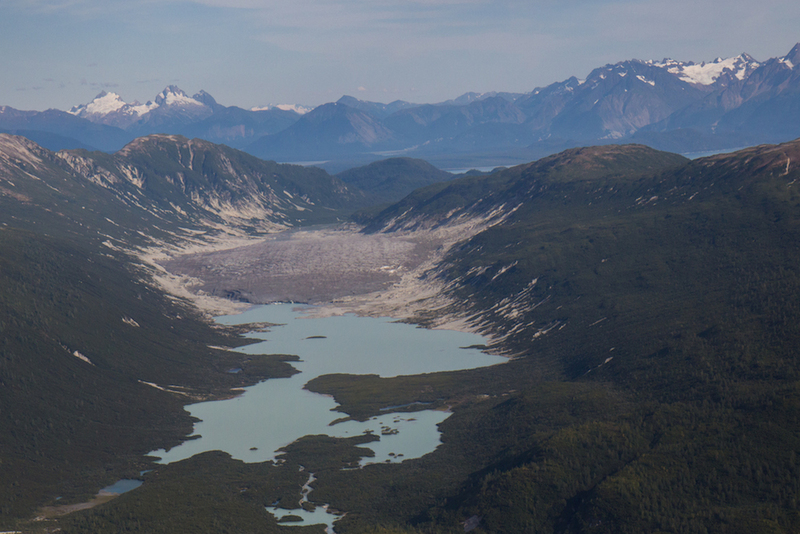 After flying over the Reid and Lamplugh Glaciers, we skirted the edge of a mountain and had the most dramatic view of the day: John Hopkins Glacier. 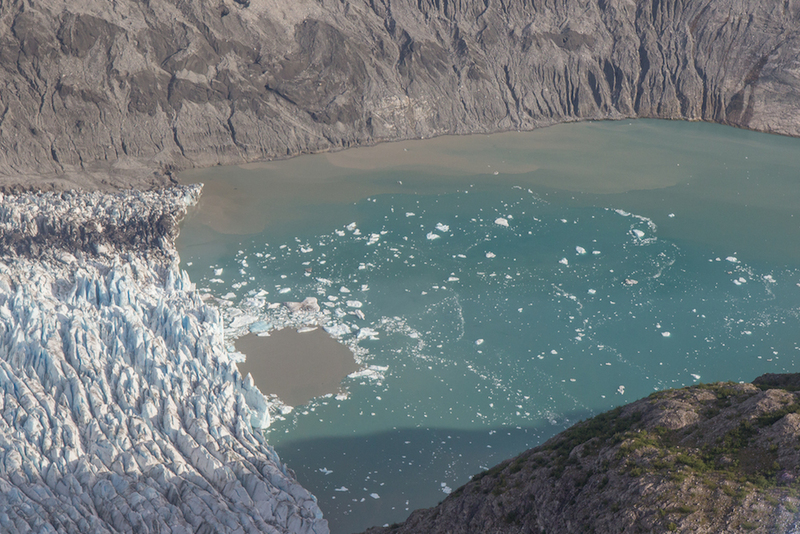 Tucked away in a fjord on the far northwest corner of the park, this glacier is the highlight of a boat tour. It is not only the most spectacular spot in Glacier Bay, but one of the most spectacular spots on Earth. 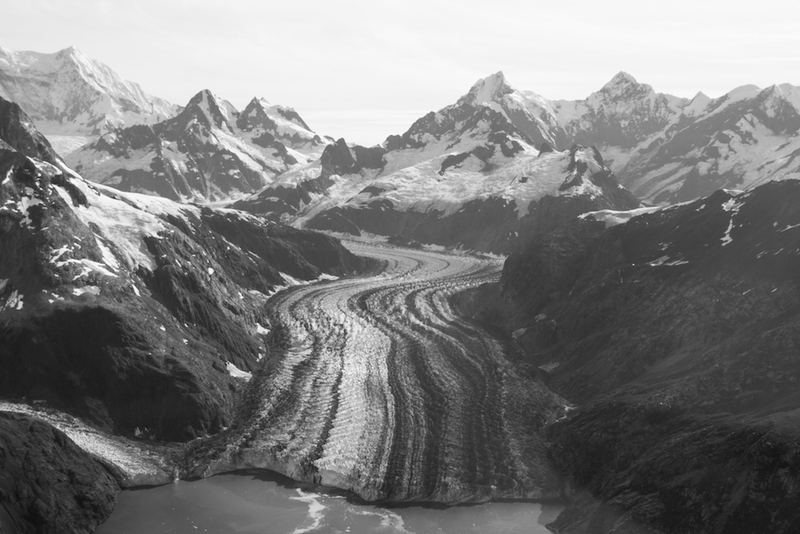 As we flew towards the massive glacier surrounded by towering peaks, I felt a bit of panic. “Where is the pilot going to go?” I thought. We felt hemmed in by the mountains; I experienced a tinge of claustrophobia. The landscape is so massive that it can be deceiving. The pilot dipped the wing and circled over the top of the glacier, which is over a mile wide, and turned amid the towering peaks. In reality, we were a safe distance from the mountains even though it felt we could reach out and touch them. Hanging Glaciers near John Hopkins. 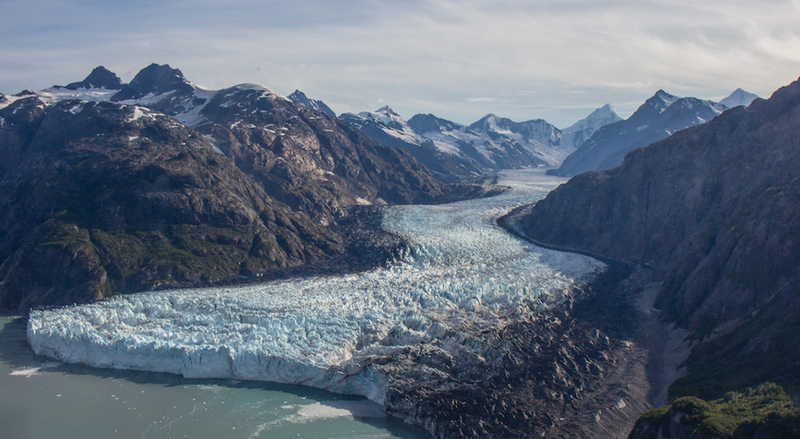 We flew back down the fjord towards Lamplugh Glacier, which afforded some of the best photo opportunities of the day. We could see the massive glacier tumbling down the mountain and see all the way down Glacier Bay, which was completely filled with ice only 250 years ago. The light was perfect. I was in awe. The plane rounded another bend and we had awesome views of the Grand Pacific Glacier which tumbles down from Canada, and the must prettier Marjerie Glacier. The pilot went right over the top of Marjerie and turned a tight circle between the mountains. 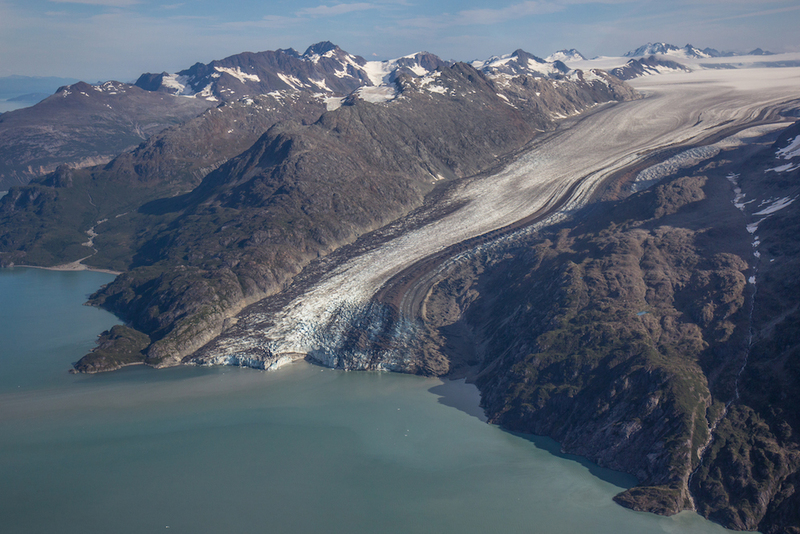 Next, we cut across the mountains and flew over the East Arm of Glacier Bay, which was very exciting. 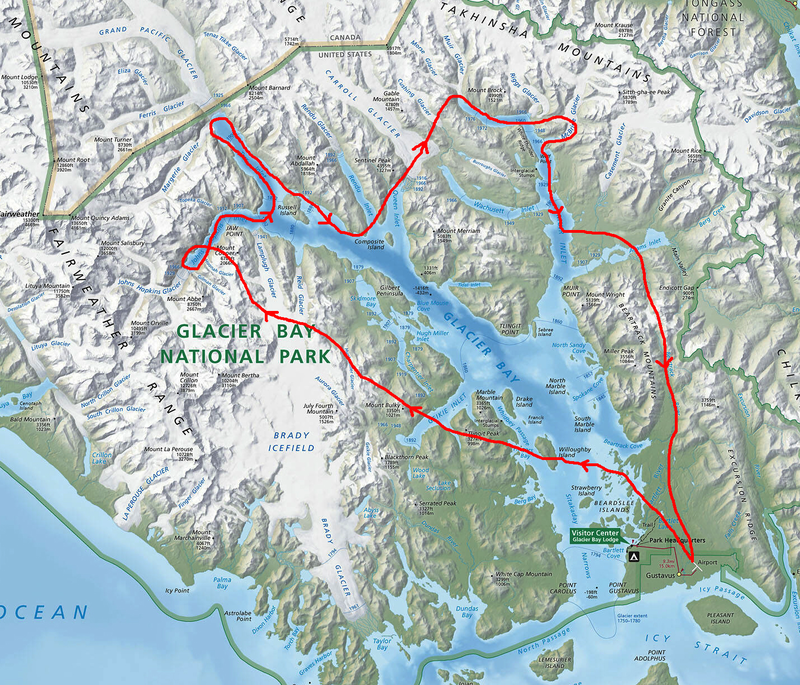 I have taken a boat tour up the West Arm of Glacier Bay three times, but the East Arm is closed to boat traffic. It is the forbidden fruit of the area. 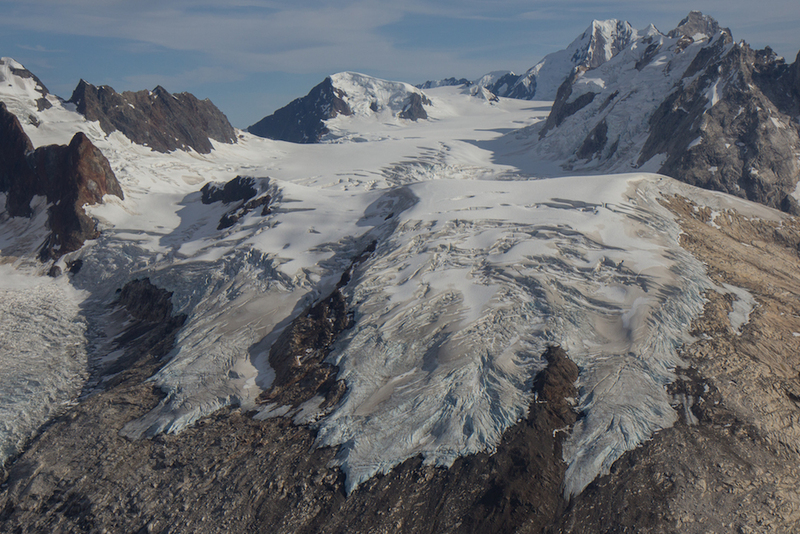 We flew over the massive Carroll Glacier, and over the toe of Cushing, Morse and Muir Glaciers. I was on the wrong side of the plane to get photos of those glaciers. Instead, I had an even better view of the colorful valleys to the south that were filled with glaciers not so long ago. Burroughs Glacier and turquoise lake. Wachusett Inlet just south of the massive Carroll Glacier. Alpine lakes above the sea. 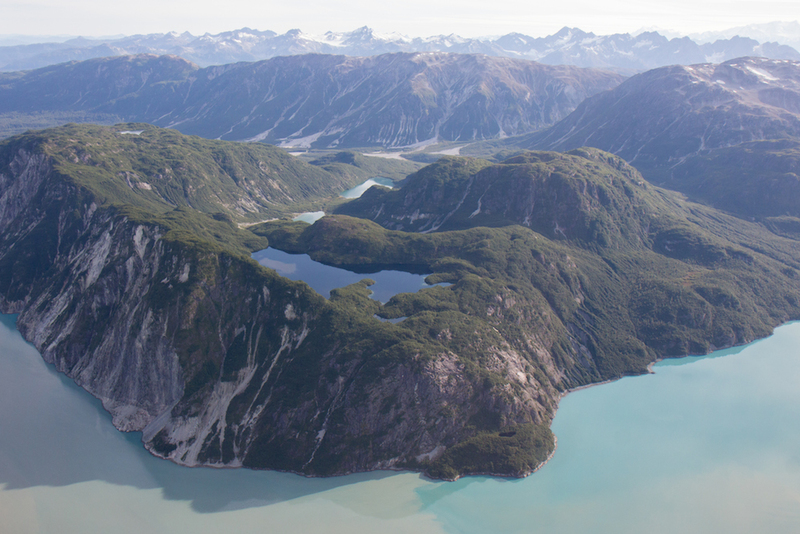 As we flew over the Muir Inlet, around more towering peaks and down Bear Track Valley, we saw countless waterfalls, translucent alpine lakes and verdant meadows that have probably never been visited by humans. It was prime backpacking area, except that it is almost impossible to access. If those mountain lakes and waterfalls were in California or Colorado they’d attract throngs of tourists. 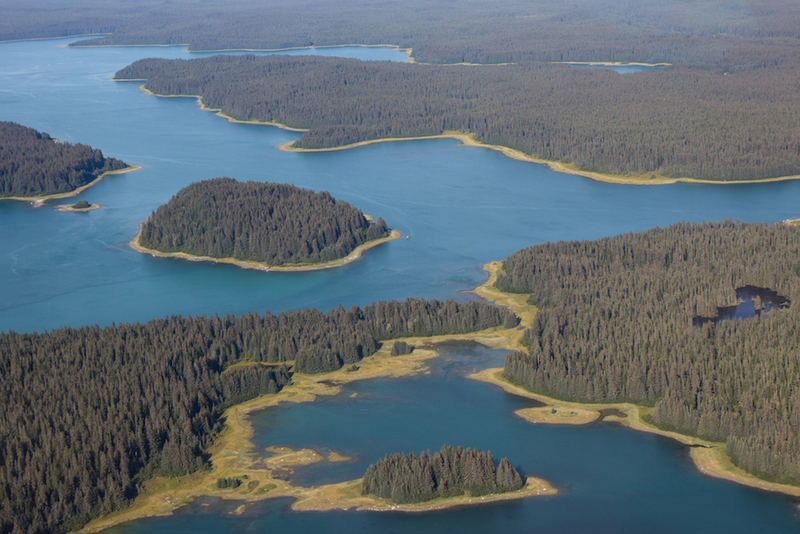 Being in the Alaskan backcountry, they get no human visitors. And if they did, those humans would be rendered speechless. What words would you use to describe Alaska? These pix are really nice! Thank you. It was a little difficult to shoot photos with my mouth agape. Amusing as always. 🙂 What an incredible experience! I’m glad you were amused, and yes, it was incredible! That must have been an amazing experience! I’m not sure I could find the right words either. The untouched wilderness of the far north is something very unique and special, partly because it’s mostly uninhabited/untouched, and because of the light. You got some beautiful photographs. You are right about the light in the far north, especially on those late summer days. We got very lucky because as soon as we landed clouds rolled in and stayed until… well, they haven’t left yet. I love the analogy of the keyhole. I can only imagine what it must the experience must have been like. Aren’t you glad your job took you to Glacier Bay this year!? YES! I love Glacier Bay. I have had several friends wok here in the past and none of them loved it that much. It is isolated and a challenging place to live in some ways, but it is awesome also. The keyhole is so true. I guess that is true for any spectacular place, but Alaska is so huge and vast that it is even harder to wrap your head around. This is something I have always wanted to do. The view from above must be absolutely incredible! I can understand why you are speechless Jeff. Spectacular! Thank Lynn. I’ve been flightseeing over and around Denali/Mt. McKinely and landed on glacier before, but this was even better I think. 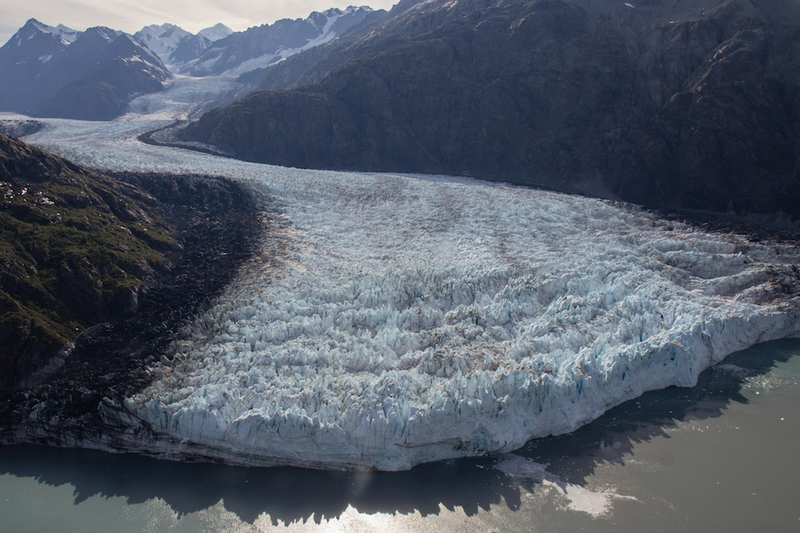 Seeing Alaska from the air gives a totally different perspective. Ho about un-freaking believable? Yes just not enough words in the language to do it justice I think. I did six amazing flightseeing trips in Denali and one in Wrangell-St. Elias, but I’m pretty sure your trip topped all of those. Jealous. Flying around the mountain and some of the stretch over the park road is just as spectacular, but I’d say overall there was a greater variety of things to look down on in Glacier Bay. I guess you’ll have to come visit next year! 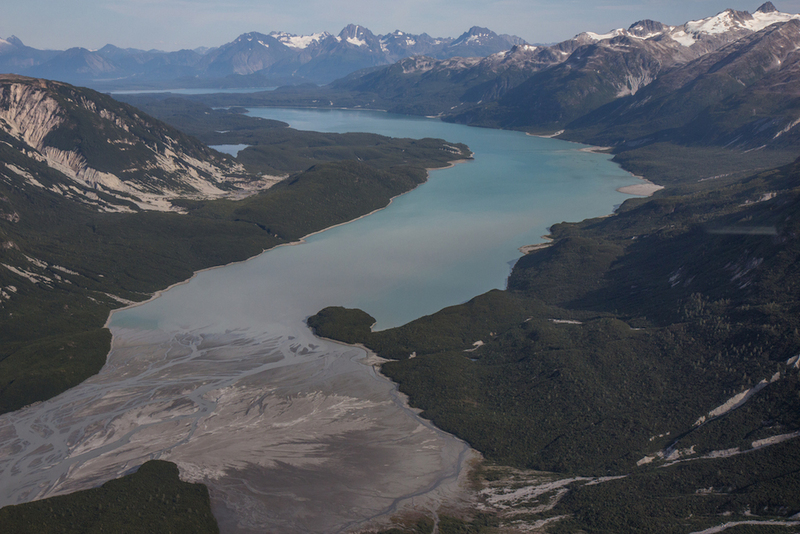 How did Wrangell compare to Denali? 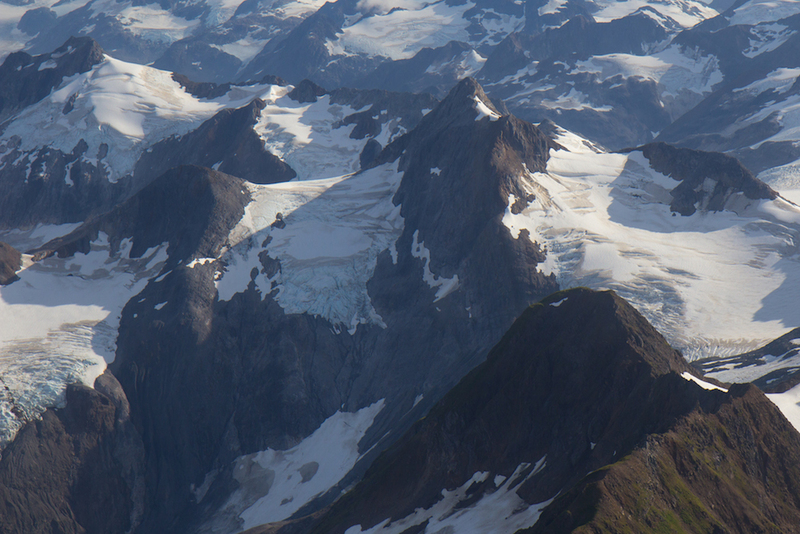 The flightseeing trip in Wrangell was mind-blowing, I enjoyed it more than my Denali trips. But I’m certainly not complaining about any of them! Whenever I get a job in the real world and can get away in summer I definitely want to visit GB. James, I remember that post on your blog. On overcast days, the glaciers are actually prettier due to the diffused light creating that deep blue, especially the Mendenhall. I love that spot – there are some great trails there. Yes you do. It is one of the most spectacular things you can do anywhere. When are you coming back? Was spring or summer a question? If so, depends. I’d say May to July in the southeast, July to September in the interior. I was just thinking spring or summer, maybe? But, yeah, it can be a question for you too. hehe. I heard if we work during summer, housing can be VERY expensive and hard to come by. Is spring colder or autumn? Housing could be tough to come by. Back in the day, some of the resorts hired nurses and provided housing. You might look at the Canyon Clinic in Denali National Park, they might still do that. Spring and Autumn are about the same temps, but in the interior there is a lot of melting snow and mud in the spring.